RETURN POLICY: This product is in guaranteed working condition. If for some reason you are unhappy with your purchase notify us within 15 days after you receive the item.All returned items must be in their original condition and packaging.Unfortunately, we cannot take returns of products that have been (dis-)assembled or modified. 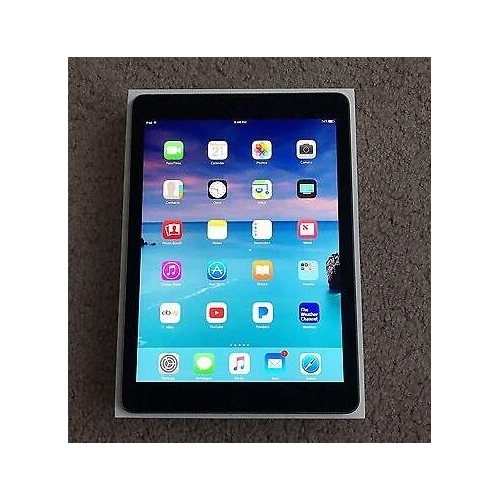 www.saleholy.com NEW ~ APPLE IPAD PRO 9.7inch 32GB WIFI+CELLULAR Space Gray Verizon UNLOCKED Detailed item info Product Information The Apple iPad Pro Tablet sports a 9.7-inch retina display with a resolution of 2048x1536 pixels and True Tone display. Powered by the A9X chip, and M9 motion coprocessor, it provides high speed and efficiency. This Wi-Fi model has a storage capacity of 32 GB, and runs on the IOS9 operating system. It features a 12 MP iSight camera, allowing you to capture sharp and detailed photographs. In addition, this tablet supports the Smart Keyboard and the Apple Pencil, and is available in space gray.